A question for historians - which sea wall protected Bay Head during Sandy? WUWT has an article about how a sea wall protected Bay Head against Sandy, while neighbouring settlements were devastated. There is a new paper in the works (dated as October 2013!). You can read about it directly here from Virginia Tech. Here's a copy of the paper I found. Not being an engineer or a coastal expert, I'll not go too deeply into the pros and cons of sea walls but note that it's not a straightforward issue. This article shows that people living adjacent to Bay Head are very concerned that Bay Head is extending the sea wall, as they believe they will be at increased risk because the sea wall will divert more water their way in future storms. Which brings me to my question. Which sea wall did the protecting? The cause of this difference lies in a forgotten historical relic. The core of the Bay Head dune was in fact a century-old, unyielding stone seawall, which had been covered over with ﬁne to very ﬁne dune sand by aeolian transport and beach nourishment during the twentieth century. The discovery of the relic seawall came as a surprise to many of the transient residents, and it constitutes the difﬁculties these transient communities have in maintaining and planning for future disasters arriving at their shores. Early 1960s Bay Head's sea walls are erected. 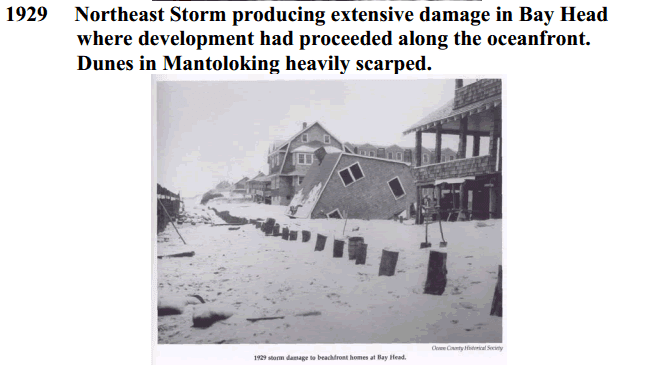 A north east storm in March 1962 took out most of the boardwalk, and also did serious damage to oceanfront properties. That prompted a group of prominent Bay Head residents to bring in rocks and build both a stone wall fifteen feet into the sand and a string of groins or jetties that protrude into the sea. Thanks to these groins, Bay Head now has twice as much beach as it had before 1962. The professor cites the Ocean County Borough of Bay Head as an example of a municipality that has utilized sea walls effectively. He notes during Sandy, the wall was exposed and there was evidence it protected some of the homes behind it. And another mention in this news article from December last year. The Bay Head Land Company was incorporated in September 6, 1879....This quickly developed Summer resort may be said to have contributed largely to the current of popular favor now bestowed upon this portion of Ocean county. It is situated at the head of Barnegat Bay, from which it takes its name "Bay Head." There are about 286 lots in this tract, 50x100 feet in size. Its present population is seventy-five. The improvements in 1882 comprise 20 new cottages, and all the other improvements in a resort in the process of development. A sea wall has been put in, roads built and graded etc. So the question is, which sea wall protected Bay Head? The sea wall built in 1882 or the sea wall built in 1962? Or both? Or maybe one was built over the other? The paper doesn't mention the 1962 sea wall, so maybe that was built elsewhere? I expect the researchers knew what they were doing. Still, it's a bit of a mystery for which there is undoubtedly a very simple explanation. 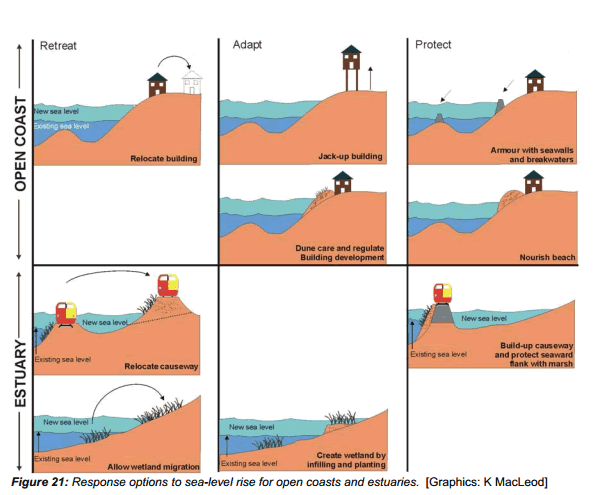 Another question though: did the sea wall at Bay Head cause more damage in neighbouring unprotected coastal areas than would have occurred if the sea wall hadn't been built? The title at WUWT is "If storms are worse now, why did they need a sea wall 150 years ago?" is typical denier country. The answer, if one gives one brain cell one second to think, is in the question. There were storms 150 years ago. In my part of the world there are remains of Roman sea defences, presumably put up because the sea level was rising in the so-called Roman warm period. But just like Find The Lady, the title is meant to lead you away from the obvious and not think.